Stadium de Toulouse was built in 1937. One year later, at the 1938 World Cup, it hosted the match and rematch between Cuba and Romania in the first round of the tournament. The stadium was further developed in 1949, but then remained very much the same for almost half a century. 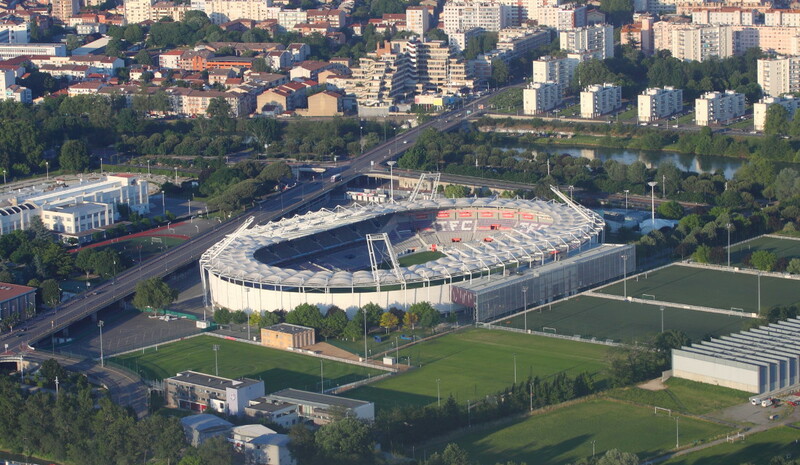 Stadium de Toulouse was selected as one of the playing venues of the 1998 World Cup, and as a result underwent a major redevelopment. During the World Cup, the stadium hosted four group matches and the round of 16 match between Holland and Yugoslavia (2-1). Stadium de Toulouse was again selected as one of the playing venues for Euro 2016. Initially an extensive redevelopment of the stadium was planned, but this had to get scaled down due to funding issues. During the European Championships, Stadium de Toulouse hosted three first round group matches and the round of 16 match between Belgium and Hungary (4-0). Stadium de Toulouse is located in central Toulouse on an island in the river Garonne. It lies about 3 kilometres south of Place du Capitole in the historic centre, and a good 4 kilometres from the central railway station. The nearest metro stations are Empalot and St Michel, both on the yellow line, from where it is a 15-minute walk to the stadium. The yellow line crosses through Toulouse’s historic centre and passes close to the central station (and can also be reached with a change from the red line). From the southern part of the historic centre (Pont Neuf, Esquirol) you can furthermore take bus 12 (to Basso Cambo), which leaves you right in front of the stadium. Get off at stop Stadium Est (or Stadium Ouest). An alternative is bus 38, which passes a short walk away from the stadium (on the east bank of the river). Take the bus from, for example, Jean Jaurès in the historic centre (direction Empalot). Both buses generally go every 10 to 15 minutes. On matchdays free shuttle buses run from train and metro station (red line) Arenes, which is located towards the east of the city. Toulouse’s airport is located in the north-west of the city. Catch a tram (T2) to Palais de Justice and get off at stop Croix de Pierre and cross de bridge to the stadium. The tram journey will take about 25 minutes. You can also catch a shuttle bus from the airport to metro stop Jean Jaurès in the city centre and take the metro from there. Stadium de Toulouse is located on the Ile du Ramier island in the river Garonne, which is a mix of sports facilities and exhibition space. There is little on the island in terms of eating and drinking and while one can find some bars and restaurants across the bridge around St Michel metro station, most will stick to the many options in Toulouse’s city centre. There are no hotels located on the island, but both the Lagrange City Saint Michel and Pier Toulouse Hotel are two good options at a reasonable walking distance of 15-20 minutes. Click here for an overview of all hotels near Stadium de Toulouse. Alternatively, there are a few more options in the southern end of the city centre which are still at walking distance, or, of course, elsewhere in the city centre. Tickets for Toulouse matches can be bought online (print-at-home), by phone +33 (0) 892 70 4000, at the club shop at the stadium, at the Box Office store at 2 Rue du Taur in Toulouse’s city centre, or at any of the Ticketnet or Francebillet sales outlets. Tickets can also be bought at the ticket windows (guichets) of the stadium on the day of the match. They typically open from 2 hours before kickoff. Toulouse only occasionally sells out a high-profile match. Ticket prices for a regular matches range from €10.00 for a seat at one of the curves to €25.00 for a seat at the upper-tier of the main stand. For a number of select matches prices are higher, for example starting at €35.00 for the PSG match. Tfc.info – Official website of Toulouse FC. Toulouse-tourisme.com – Official site of the Toulouse tourist office. Tisseo.fr – Toulouse public transport information.